The global financial factor, a common component in international financial flows, is relevant to debates on the role of exchange rate flexibility in insulating economies from foreign shocks, the international monetary system, as well as the use of macroprudential and capital flow management tools. Global factors such as the VIX (the CBOE Volatility Index) and US monetary policy have been found to dominate global capital flows and financial conditions (Rey 2013, Bruno and Shin 2015). Recent studies moderate and add nuance to the message around the strong role of global factors (Cerutti et al. 2017, Obstfeld 2015, Obstfeld et al. 2017). Forbes and Warnock (2012) and Avdjiev et al. (2017) suggest that the global factor’s importance is concentrated in periods with elevated stress and volatility risks. Rose (2017) forcefully argues that attention to the global factor has been overstated, and criticism of the international monetary system is not justified, based on the ‘low’ explanatory power of the global factor in international capital flows data. In a recent paper, we argue that some earlier evidence on the role of the global factor may be inaccurate, because it has ignored key features of the operation of central banks within the international monetary system (Goldberg and Krogstrup 2018). To properly capture pressures on currencies and international capital flows, analyses need to account for policy actions taken to offset some of these pressures. In short, comparing capital flows across countries with different exchange rate regimes, as is usually done in the literature, is like comparing apples and oranges. Using our new Exchange Market Pressure (EMP) Index, we find that global factors are sometimes important, particularly around stress events, and differ considerably by type of country. Looking across countries and over time, international capital flow pressures may not be well captured by our standard data. Exchange rate and monetary regimes imply that various policy interventions mask the effects of observed stresses. Many countries intervene in international markets by using foreign exchange reserves, as compellingly documented in Ghosh et al. (2017), limiting the information content of exchange rates. Moreover, capital flow data may not fully reflect international pressures when exchange rates rapidly adjust to news. Alternative metrics of international capital flow pressures are required. Building on the earlier literature on exchange market pressure indices pioneered by Girton and Roper (1977), we introduce a new way to monitor international capital flow pressures using the EMP index. This new EMP is akin to a ‘super exchange rate’ that incorporates both realised exchange rate movement and policy intervention (purchases and sales of foreign exchange reserves and rate changes) by central banks. A key difficulty is how to add up different price (e.g. exchange rate) and quantity measures (official foreign currency interventions) in a logically consistent way. Our measure is a theory-based approach to this problem. If changes in demand for, or supply of, a currency are primarily reflected in official foreign exchange (FX) interventions, this measure obtains the equivalent, or counterfactual, exchange rate depreciation that would have restored balance of payments equilibrium in the absence of FX interventions. It yields a conceptual weighting approach relying on volumes of gross foreign assets and liabilities, with their elasticities of response to exchange rates. We define our measure in rates of local currency depreciation against the base currency that is relevant for country policy and official sector foreign exchange intervention, following the Shambaugh Exchange Rate Classification (discussed in Klein and Shambaugh 2010). At every point in time, the capital flow pressures captured by the EMP are relative to those affecting the base currency. Figure 1 illustrates how international capital flow pressures manifest themselves across the different exchange rate regimes for Switzerland and Australia, and how the EMP adds these different manifestations up to a single index. The red line depicts monthly relative changes in the Swiss franc or Australian dollar exchange rates against the base currency (the euro and the US dollar respectively), while the blue line captures monthly changes the central bank’s FX reserves scaled by the model-implied equivalency weight that turns these quantity changes into relative exchange rate changes. The black line adds the two types of pressures up to the EMP. In Switzerland, capital flow pressures were, to a considerable extent, met by FX interventions since the onset of the Global Crisis, preventing strong exchange rate movements against the euro. FX interventions have consequently been the main driver of the EMP for Switzerland in recent years. In Australia, by contrast, FX interventions have been much less prominent, and the EMP has been mainly driven by exchange rate changes. As a consequence of this type construction, the EMP is highly correlated with realised net capital flows when countries manage the exchange rate, but not so much in countries with freely floating exchange rates. If countries allow the exchange rate to adjust in response to capital flow pressures, it stunts private capital movements compared to when the exchange rate is prevented from adjusting. Figure 2 illustrates this point more generally for the sample of countries we investigate in our paper. 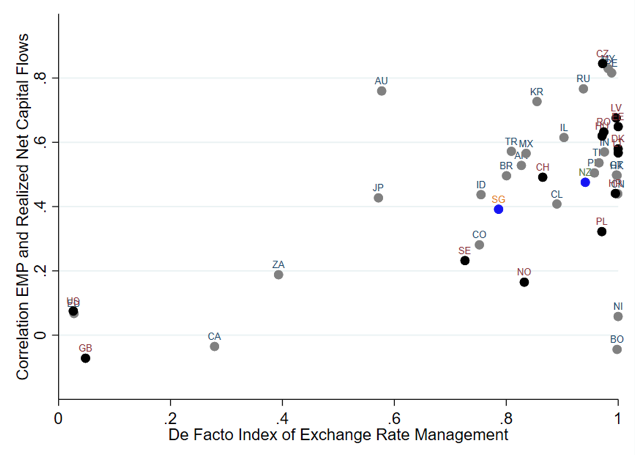 The horizontal axis depicts an index of the degree to which countries manage their exchange rate. A value of zero indicates a freely floating exchange rate while a value of 1 suggests a strongly managed exchange rate. The vertical axis depicts the correlation coefficient of quarterly averages of the EMP and quarterly net private capital flows in percent of GDP from the IMF’s Financial Flows Analytics Database. The dots suggest that the less the exchange rate can adjust freely to capital flow pressures, the higher the correlation of the EMP with realised net private capital flows. This feature underlines the importance of taking account of the exchange rate regime when investigating common factors in capital flow pressures across countries. As an application of this new EMP measure, we revisit the debate on the size and importance of the global factor for a panel of 44 countries from January 2001 to October 2017. We consider three country groupings, so called ‘safe havens’ (the US, Japan, Switzerland), emerging markets (EMs), and other advanced economies (‘Other AEs’) and estimate empirical specifications similar to those of Cerutti et al. (2017) using the monthly EMP instead of the quarterly capital flows. The regressions generate estimated global factors by date and country grouping. Global factors indeed have a somewhat greater explanatory power in driving the EMP compared to regressions using net capital flows but, on average, it is not large. We also find striking nuances in the evidence about the global factor. The role of the global factor is highly sensitive to the time period and sample countries studied. Importantly, global factors are strongest in major stress periods. Moreover, there is a similar directional impact on EMs and other AEs, but an opposite directional impact on EMs and safe havens during the crisis and post-crisis. These findings are consistent with the earlier motivation on international capital flows, as some periods are more defined by local factors, and others by global ones. We also explore the evolving country-specific EMP response to global risk sentiment, and ask what currency acts as a ‘safe asset’ and when. To answer these questions, we introduce a Global Risk Response index (GRR) as a country-specific partial standardised correlation between the EMP and the VIX, controlling for domestic and foreign policy rates. We illustrate evolving safe-haven status with the GRR based on 5-year rolling windows over monthly data for 44 countries. We find that the status of any country can change dramatically over time, and that a robust characterisation as a safe-haven currency or country is again specific to particular periods and not an immutable status. Both exchange rate and capital flow data have shortcomings for analysis of global factors as these are biased by exchange rate regimes in place. The new Exchange Market Pressure and the Global Risk Response indices complement the analysis of international pressures on currencies, and across exchange rate regimes. Using the EMP, we find that the global factor is sometimes important, particularly around stress events, differs by type of country, and does not generally dominate the variation across countries at any point in time, or over time. The dataset on the new EMP is available for download here. Authors’ note: The views in this column are solely the responsibility of the authors and do not necessarily reflect the views of the Federal Reserve Bank of New York, the Federal Reserve System, the IMF, its Executive Management or its Board. The authors thank the World Economic Forum, and Liana Melchenko, for encouraging our collaboration. Avdjiev, S, L Gambacorta, L Goldberg, and S Schiaffi (2017), “The Shifting Drivers of International Capital Flows”, NBER working paper 23565. Bruno, V, and H S Shin (2015), “Cross-Border Banking and Global Liquidity”, Review of Economic Studies, 82, 535-564. Cerutti, E, S Claessens, and A Rose (2017), “How Important is the Global Financial Cycle? 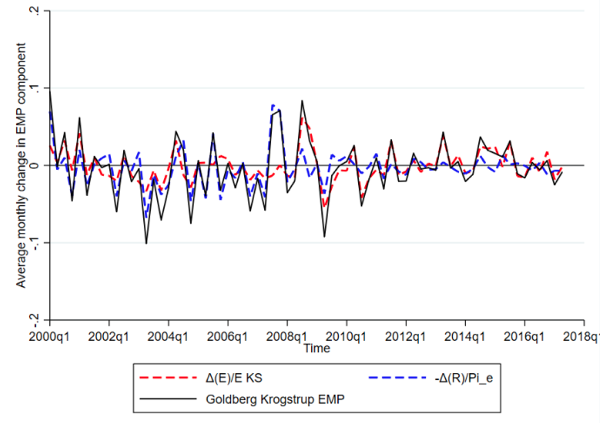 Evidence from Capital Flows”, CEPR Discussion Paper no. 12075. Forbes, K, and F Warnock (2012), “Capital flow waves: Surges, stops, fight, and retrenchment”, Journal of International Economics, 88, 235-251. Girton, L, and D Roper (1977), “A monetary model of exchange market pressure applied to the postwar Canadian experience”, American Economic Review, 67, 537 - 548. 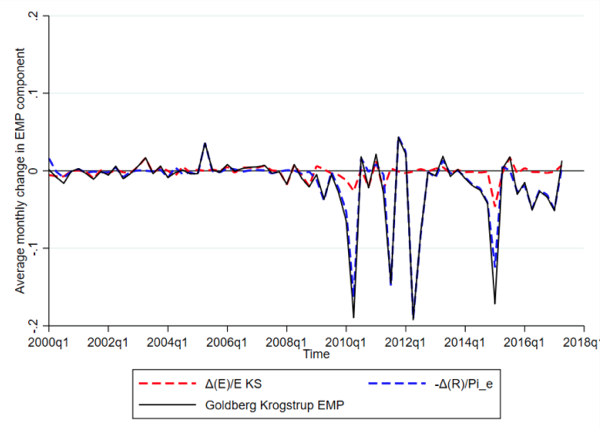 Goldberg, L, and S Krogstrup (2018), “International Capital Flow Pressures”, IMF Working Paper no. 18/30. Also NBER working paper 24286 and Federal Reserve Bank of New York working paper 834. Klein, M, and J Shambaugh (2010), Exchange Rate Regimes in the Modern Era, MIT Press. Obstfeld, M, J D Ostry, and M S Qureshi (2017), “A tie that binds: Revisiting the trilemma in emerging market economies”, CEPR Discussion Paper no. 12093. Ghosh, A, J D Ostry, and M Qureshi (2017), “Managing the Tide: How do Emerging Markets Respond to Capital Flows?”, IMF working paper 17/69. Rose, A (2017), “The global financial cycle: Closer to an anticlimax than a juggernaut”, VoxEU.org, August 14.